The story was based on a novel by Rafael Sabatini. With the war in progress, the filmmakers were trying to conserve their film stock. Many of the scenes in the movie were from one take. 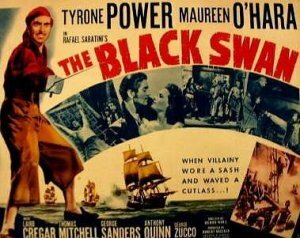 By the time The Black Swan was released, Tyrone Power had already reported for duty with the USMC. 20th Century Fox kept The Black Swan and Blood and Sand in continuous release during the war years in order to keep Tyrone's face and name before the public, since he was unable to make new films, due to service. Others also re-issued during the war years were In Old Chicago, The Rains Came, and Johnny Apollo. Ty's love interest in the movie was the beautiful, Maureen O'Hara. In her recently released (2004) book, Tis Herself, Ms. O'Hara speaks of Ty and the filming of the movie. She refers to him as "murderously handsome", and speaks of his devilish sense of humor. She goes on to say that she enjoyed working with him on The Black Swan and was happy to be able to work with him in later years in The Long Gray Line. 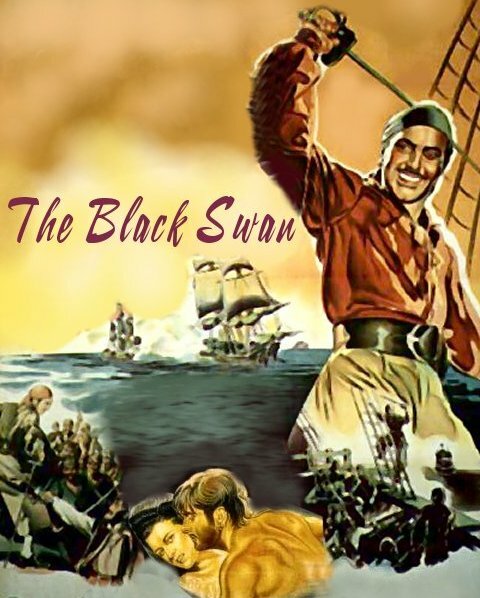 Variety: "The Black Swan is an apropos action-full au revoir to pictures for Tyrone Power, now in 1naval uniform. This one can't miss making the wickets whirl. Both Power and Miss O'Hara turn in good acting performances ..."
Time: "The Black Swan dives headfirst into a Technicolored sash of kicking senoritas and their buccaneer abductors, settles down handsomely to routine piratical high jinks.... For Sabatini addicts, there is veteran director Henry King's expert translation of Sabatini's romantic novel about young love and buckets of blood on the Spanish Main. 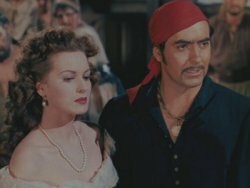 For others, there is a coy love affair between Tyrone Power and Maureen O'Hara. Time and again (on the rack, swimming, and by a neat sidestep of the Hays office, in bed with her), Mr. Power gives Miss O'Hara and cinemaddicts an eyeful of his expensive torso."